Tauroctony (killing of the bull, a central part of Mithraism), in Kunsthistorisches Museum, in Wikipedia. It isn’t uncommon on the internet to find claims that christianity is just a copy of some pagan religion, and Jesus is no more historical than some mythical pagan god. One of the most common claims centres around the Roman mystery religion of Mithraism. What does the evidence tell us? Historians are almost totally agreed. Christianity did not borrow from Mithraism. The claimed parallels are mostly invented, and Mithraism came on the scene too late. The “evidence” for the claims is mostly based on outdated authors whose views have long since been overturned by historians. Mithraism was a mystery religion practiced in the Roman empire, probably only by men and especially by soldiers, in the first to fourth centuries. Followers went through a series of secret initiations and rituals (that’s why it is called a ‘mystery religion’), and met in underground temples (called a mithraeum), many of which have been found by archaeologists. Mithra was born of a virgin on December 25th in a cave, and his birth was attended by shepherds bearing gifts. As the “great bull of the Sun”, Mithra sacrificed himself for world peace. It used to be thought that the later belief in Mithras grew out of the much earlier belief in Mithra. Scholars no longer believe this, because there is no evidence for it. Some of the sceptics’ claims draw on both religions and different points, giving the impression they were one religion. Very little is known about the later Mithraism, because no texts have been found. What we know comes from archaeology (hundreds of mithraea have been found, also scenes in reliefs such as that at the start of this post) and in the writings of christians and other pagans in the second and third centuries. As Prof Bart Ehrman says: “we know very little about mystery religions – the whole point of mystery religions is that they’re secret! So I think it’s crazy to build on ignorance”. However this makes it easier for “sceptics” to make claims about Mithraism. Scholars have found no clear evidence of Mithraism until the mid to late first century, after christianity was established. Almost all we know of it comes from the second and later centuries. If there was any copying, it would have to have been the other way. But actually, scholars say the two are almost totally independent. Prof Ronald Nash: “The flowering of Mithraism occurred after the close of the New Testament canon, too late for it to have influenced the development of first century christianity.”. Since there is no record of Mithras dying, there is no record of him being resurrected either. Mithras was a god, not a human, so he wasn’t a teacher and he didn’t have disciples. There is no record of him actually living at all. Mithras was not born of a virgin, but out of a rock (this is shown in some of the stone reliefs, we don’t have any actual accounts of this). And as the Bible doesn’t say that Jesus was born in a cave, nor was the date 25th December, the birth parallels are non-existent. 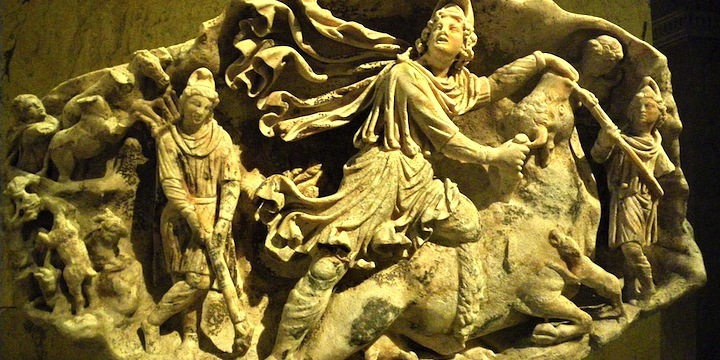 There is no record of the christian terms like “Messiah”, etc, being applied to Mithras. It would be pointless to go through every claim. According to the experts, virtually none of them have any validity. The only similarities are those which might be common among many religions. Ronald Nash, Head of the Department of Philosophy and Religion at Western Kentucky University (2003): The Gospel and the Greeks: Did the New Testament Borrow from Pagan Thought? and “Mystery Religions of the Near East,” Baker Encyclopedia of Christian Apologetics, 199, quoted in Wikipedia and Come Reason Ministries.